There’s no doubt that the world of warehouse management has undergone a lot of change during the last couple of years. Modern storage is all about innovative systems for handling the materials, collecting information, and maintaining smooth communication. All of these technologies are used for one purpose – ensuring that every single package is delivered to the right address. So, if you’re starting a warehousing business, you have to know exactly what these technologies do and which of them you need the most. That’s why we have come up with some of the most advanced technologies that are already changing the entire industry and might just be what your startup warehouse needs. Long gone are the days when you had to go and collect all the information on the goods within your warehouse yourself. Today, there are technologies that can keep track of every single item that arrives in your warehouse without any use of paper. These devices can be hand-handled but you can also mount them on your forklifts and cranes. Furthermore, these systems use barcode validators to provide you with all the necessary information about the goods. This means that a single barcode scan tells you everything you need to know about an item, and there’s no need to keep any written records of the goods you keep in your warehouse. Having said this, investing in paperless technologies is a great move for your startup since it saves you time and makes it much easier to keep track of the goods that enter and leave your warehouse. Today, there are technologies you can use in your startup warehouse to automate handling all the boxes, packages, and pallets. These devices are there to replace laborers and forklifts for the tasks of moving the goods around your warehouse. First of all, there are conveyors which are used for moving the goods from one point inside of your warehouse to another one. There are also more sophisticated devices, such as sortation technologies, which ensure that every single box, package, or pallet is delivered to the desired location within the storage. If you’re ready to invest even more, you can also go for the latest robotic technologies which are a great alternative for manual labor when it comes to unpacking and arranging the goods. Of course, you still need a well-organized staff to be in charge of all the technologies your warehouse uses. With all the material handling and paperless technologies we have today, there are solution sets the majority of the warehouses use. 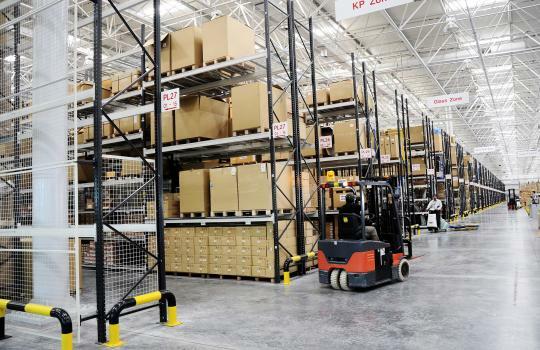 There are full pallet handling solution sets which are a great cost-effective option for warehouses that use industrial pallet racks for storing their goods. These don’t take up too much space and have flexible cranes that can be used to move smaller objects around your warehouses. Batch picking solution sets are another popular option among the warehouses today. They use conveyor belts and smart separation algorithm to place every item on the right pallet. This set can help you speed up the work in your warehouse and make it less intensive for your staff. And if you want to automate the way items are labeled and validated, a split case handling solution set is another solution you can consider for your warehouse. Such rapid advancements in the world of warehousing systems are going to automatize the entire storage industry and enable warehouse owners to run their businesses without having to hire loads of employees. Furthermore, we can only expect new improvements to give warehouse owners more options and make running the business much easier.